This Kit will work on all 2017-0n Husqvarna enduro bikes (both EFI 4T, Carb 2T, & TPI 2T) with a high/low beam and 200w stator. 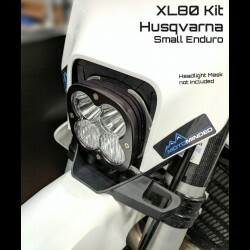 HUSKY HEADLIGHT MASK NOT INCLUDED !!! - PC/PBT Frame & Aluminum locking wing = lightweight and rugged. - Highly adjustable tilt so you can get he correct aim. - LEDs come in Combo pattern. FOR 4T EFI & 2T TPI MODELS-CHOOSE "DIMMER" VERSION ON DROP DOWN. FOR 2T CARBURETTOR MODELS CHOOSE "AC CARB" ON DROP DOWN.